However, financial literacy, which is the understanding of how matters of finance work in the United States and the world, is not universal. While the U.S. Department of Education and the National Institute of Literacy have determined that 14 percent of adult Americans cannot read, the financial literacy of Americans, including those with significant wealth, is much higher. The 2008 economic collapse served as a wake-up call to many investors, who previously depended entirely upon their advisors for investment decisions. Financial literacy is now an aggressive pursuit in some elementary school systems and many secondary schools are increasing educational opportunities to advance the financial literacy of students approaching adulthood. Still, reports continue to demonstrate a lack of financial awareness among Americans. The National Foundation for Credit Counseling Consumer Financial Literacy Survey from 2014 showed that 60 percent of U.S. adults graded themselves as an “A” or a “B” on their knowledge of personal finance. That leaves 40 percent grading themselves no higher than a “C”, and that’s self-grading, which tends to be overly optimistic. Spectrem’s whitepaper Financial Literacy: Do the Rich Know Something We Don’t shows that as wealth increases in investors, so does financial literacy. That fact then creates the question as to which comes first, the wealth or the knowledge? Financial knowledge does not necessarily mean a lack of involvement with advisors. Senior Corporate Executives are among the most knowledgeable investors by occupation but they are also often the most dependent on their advisor, perhaps as a function of time allotment or the desire to work with professionals in all aspects of their lives. Also, the older an investor is, the more likely he or she is using a financial advisor for investment advice. This indicates that as an investor gets older and probably a bit wiser, they are more likely to use an advisor. The value of financial literacy and knowledge differs among investors. When asked by Spectrem how important their financial knowledge is to them, half of Millionaires (with a net worth between $1 million and $5 million) responded that it was “extremely important,” compared with just 27 percent of Mass Affluent households with a net worth of less than $100,000. It is also true that the wealthier the investor, the more they believe themselves to be knowledgeable about finances and investments. Additionally, the wealthier the investor, the more likely they are to note intelligent investing helped create their wealth. 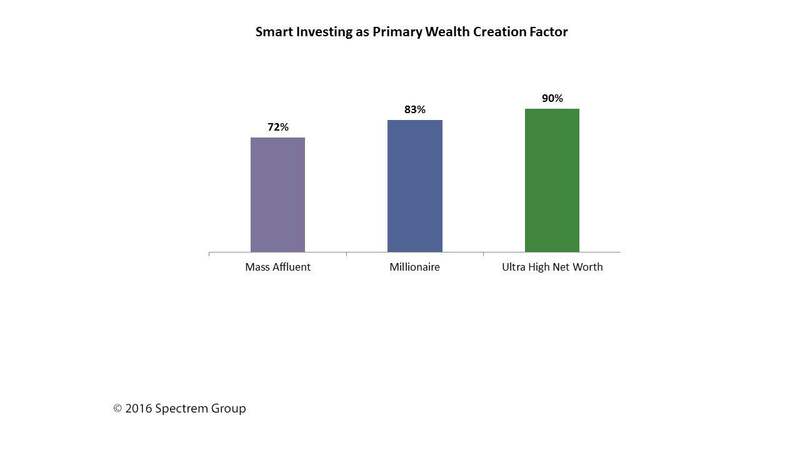 Among Mass Affluent investors, 72 percent consider smart investing to be the primary factor in their wealth creation. In comparison, 83 percent of Millionaire households cite smart investing as the driver of their financial success. This percentage is even higher (90 percent) among Ultra High Net Worth households with a net worth between $5 million and $25 million. It is possible there are investors who just don’t want to know what is going on in the markets or the economy and just want to see the bottom line. But most investors probably want to understand as much as they can about the factors affecting their portfolio. While it is not in the advisor’s job description to educate investors, it would be easy to offer reading material or online courses that could explain certain topics that matter to investors and investing strategy. Having that information available on your website would be a way to keep your firm in touch with an investor. It might seem a bit counterintuitive, but more knowledgeable investors are more likely to take advantage of the opportunity to consult an advisor about investment decisions. Also, conversations between investors and advisors go more smoothly when the investor knows what the advisor is talking about. This is another indication that advisors should promote the financial education of investors for the good of the investor and the benefit of the investor-advisor relationship. Investors will often learn about certain investments or hear about trends on cable news. Make sure you are aware of what is being discussed as “hot topics” on some of the well-known investment shows so you can answer questions regarding whether something should apply to their situation.